So all you parents out there...I'm quite sure your kids watch TV. My kids love TV and I love that they watch it. It gives me a much needed break in the day. Layla can speak fluent Spanish because of Dora. HA! Not really, but I think my kids learn from some of the educational TV shows that they watch. ANYWAY...you know advertisers and marketers, they play commercials during iCarly. I can't tell you the number of times my sweet Layla has come into the kitchen while I am cooking and repeated verbatim a commercial she just saw. She will usually pause the TV so that I will go into the playroom to see whatever item she is raving about that day. I have heard all about Twinkle toes shoes, the butterfly garden, Kids Bop 18, and pillow pets. Do you feel me here? Well, I fell for one of these crazy commercials! It was crazy the way it happened. The commercial was for pillow pets. Gary was home the day Layla grabbed our hands and took us to the TV screen. Before we entered the room she gave us the down low. Hayden is sitting on the futon saying "p-ow-pet p-ow pet" and pointing at the TV screen. Don't you hate it when they gang up on you. Anyway, weeks go by and when we see the commercial it is the same drill...kids dying, freaking out wanting a fluffy dust catcher. They really are cute, and Gary and I even had a conversation about ordering them each one. We just didn't know when. When my friend Shelby was in town we hit the local mall to do a bit of school shopping. While we were there we stopped at the food court for lunch. And low and behold there was a kiosk with pillow pets. Right there in front of Chic- fil-A. The kids freaked out when they saw them. Shelby's girls had been wanting one too. They watch a ton of iCarly also. So us moms caved. Look at Hayden with his moose. How cute is that? Little Miss Layla with her unicorn. Macy got a small dolphin and it is precious! And Mia picked out an adorable kitty cat. The kids were so happy, and it was worth it to see their smiles and their faces were priceless with the excitement of chosing which animal was the best for each other. Layla and Mia were going to get the same animal, but then we made them stop and think about what they really wanted. It was fun and memories were made. Have you ever bought a toy or item that your kids raved over for weeks? Both of my children want one and I've debated over whether or not to get one. They have it all planned out, which one they are going to get...and have even included me in on the plan. They picked out the dolphin for me since I love dolphins. I may have to break down...maybe for Christmas. Do I ever hear you on this one. And the verbatim repeats of commercials? It cracks me up! I had never heard of pillow pets before today, they are awfully cute. I remember when I was a kid my Mom made me a Strawberry Shortcake pillow/PJ bag. It turned into a pillow once you put your PJ's into it, it zipped up. It was super cute. Girl, I have giggled over these commercials so much!! I dunno why, but I have. Emma always says she wants one and when we are in the mall I try to steer the opposite way of these so they don't see them! ha, I am not going to be mom of the year like you! Your kids look like they love them!! So sweet! All summer I've been trying to get Nolan to learn some sight words (it's the educator in me) and we worked on them ALL summer...Ok, so maybe I felt bad that I hadn't been doing anything with him all summer so it's been about three weeks. Anyhow, he know know all 40 of them! So I went out and bought him a Lightning McQueen prize. I'm a sucker too! 1. I bought 2 pillow pets for my nieces about 3 yrs ago. There was a guy who always came to our school to sell teachers books and stuff and i ordered 2 pillow pets from him. 2. I currently own a toothpaste dispenser that Drew saw on TV and kept asking for. I found it at Walgreens and just had to get it for him. It actually makes him excited to brush. Hope the kids have fun with their pillow pets. My Mom is a TV shopaholic! I keep threatening to call the cable company and cancel her so she cant shop anymore! 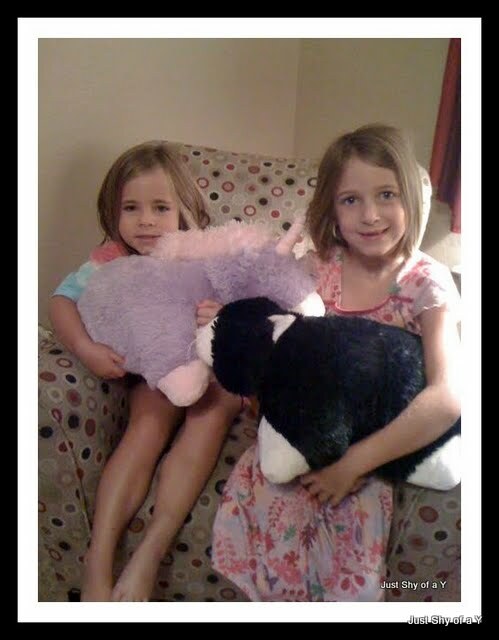 Rhiannon has been driving me crazy for a pillow pet too! LOL...Emily and I walked into Walgreens the other day right into a display of Pillow Pets! Guess which one she got...the Unicorn! She has always wanted one too...but I don't order stuff from tv...but there it was, just like you said, haha! They are cute, and she sleeps on it every night! The other one they've wanted,but not anymore is the toothpaste dispenser you suction onto the mirror! haha! Not falling for that, they can squeeze it out themselves! Oh my goodness! Your kids are too cute! And I have to admit, after seeing the commercial, my BF and I both agreed that the pillow pets are such a great idea! And we don't even have kids..!